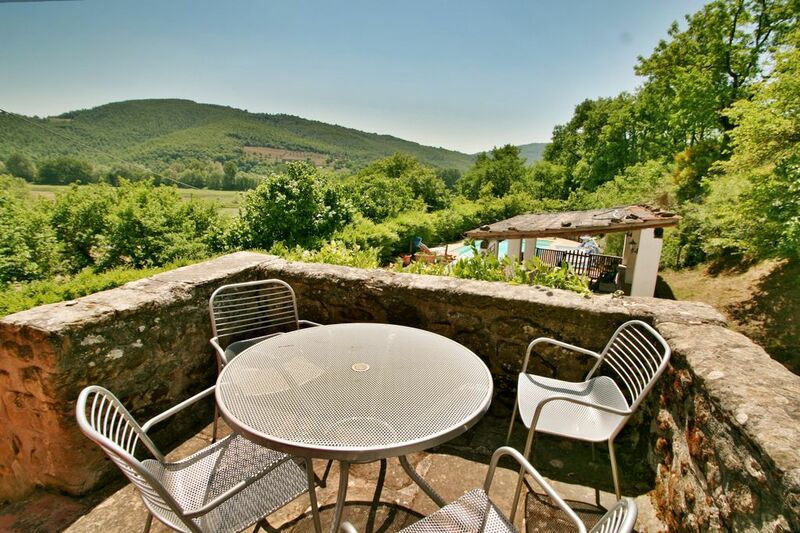 Casa Gorgacce is situated at the Tuscan end of the picturesque Niccone Valley which runs into Umbria. The house stands on its own surrounded by its own grounds. The village of Mercatale di Cortona is about 2.5km from the house, it is a friendly village with shops, cafes and a popular trattoria. the Umbrian village of Lisciano Niccone is a further 1 km and has a pizzeria/trattoria. The living accommodation at Casa Gorgacce is all on the first floor reached by wide steps from the parking area below. At the top of the steps is the loggia with table and dining chairs and a retractable awning for shade in the summer months. The front door open onto a large room with fully fitted kitchen to the near end, dining area and sitting room with sofas and armchairs in front of the fireplace at the far end. The master bedroom is directly off this room and has a queen size bed and en suite bathroom with shower (no tub). At the far end of the living room is a door through to a hallway off which are a bathroom (shower) and another double bedroom and a room with 2 single beds. The house has ceiling beams throughout and terracotta floors. There is parking space for one or two cars at the front of the house - there is another parking area at the rear. From the steps at the front of the house a gravel driveway leads to the pool area and covered barn. The barn has table and chairs for dining and a barbecue. The pool measures 9 v 4.5 metres and is fenced and gated. The owners (UK residents) have an apartment on the other side of the house on the ground floor which they use occasionally. They are respectful of the privacy of guests and do not use the pool. Free wifi. Casa Gorgacce is rented exclusively by Gorgacce Rentals: renting houses since 1993. I am Emma Cordingley, the booking agent for Casa Gorgacce. I have lived in the area since 1999 and with my husband, Martin, run a small rentals agency that was started by my parents in the 80s. I am originally from the UK where I was a high school teacher. I have 2 teenage daughters. I like walking, gardening, cooking, films and reading. I love everything Italian. Martin has run wine tastings locally for the past 10 years or more, in January 2016 he qualified as an Italian sommelier. he has also written a book of local walks and leads walks in the countryside and some of the local towns. The owners of Casa Gorgacce are family friends of mine from Teddington, Greater London. They and their children and grandchildren are regular visitors. Casa Gorgacce used to be owned by my parents and I lived at the house permanently between April 1999 and June 2000. As booking agents who live nearby we want all our guests to enjoy their stay at Casa Gorgacce. You can book knowing that we are on hand to deal with problems that may arise during your stay, we are always available by phone, text, WhatsApp and by email. We invite all our guests to a wine tasting evening at the local vineyard. This is a regular event run by by husband Martin Daykin who passed his Italian Sommeliers Association exams in January 2016. En-suite bathroom to bedroom 1 has shower, wc and basin. Bathroom adjacent to bedrooms 2 and 3 has shower, basin and wc. On the grounds of the house, off street. The kitchen has 4 ring gas hob, electric oven, dishwasher, fridge freezer, microwave and toaster and washing machine. There is a first class 18 hole golf course at Antognolla, a 30 minute drive. Lovely house close to Mercatale village which we enjoyed doing our shopping at. The house-keeper made us a great vegetarian lasagne for our arrival, it was so good we ordered another one. Also some great places to eat nearby. I'm really pleased you enjoyed Pasquina's lasagne, I will pass it on to her. Thanks for taking the time to review. Our family of 5 had a very enjoyable holiday at Casa Gorgacce. We frequently come to the Niccone Valley but it was our first stay here. It was great to be close to Mercatale for shopping and eating out, we really enjoyed our village visits. The house is very easy to live in and very comfortable. The loggia is a fantastic place to sit any time of day - or all day! Great views. Thank you for your review, we are glad that as regular visitors to the Niccone Valley you enjoyed your stay at Casa Gorgacce. Casa incrível. A casa é linda, tipicamente toscana, paisagem fantástica, limpeza e arrumação em ordem quando chegamos, decoração agradável e jardim belíssimo. Usamos a lavanderia sem problemas, máquina em funcionamento mas não tem secadora. Como estivemos sob sol intenso todos os dias, tudo certo para a secagem. De lá pudemos conhecer uma dezena de cidades maravilhosas e em Camucia (Cortona) existem diversos mercados para abastecer a casa (atenção: fecham às 20 horas e depois disso você não encontra absolutamente nada para comprar, nem delicatessen ou qualquer comércio; cuidado, portanto, por quem é acostumado com grandes cidades). A experiência foi um sonho. We couldn't have been happier with our stay at Casa Gorgacce. It is a very comfortable house and ideal for two couples. Beautifully clean and tidy and well-equipped. We rented bikes in nearby Lisciano Niccone and it was no problem to cycle into the village in the morning for coffees and shopping. The bikes enabled us to explore the lovely countryside, brimming with flowers close up. The pool warmed up while we were there and it is lovely relaxing spot. Most enjoyable was having a drink on the loggia in the evening, or breakfast in the morning, enjoying the views. thank you for taking the time to write a review of Casa Gorgacce, we are pleased that you enjoyed your stay and that the pool warmed up for you. We stayed here for a family Easter holiday in April 2017. We found the house clean and well-presented and as advertised. The kitchen was well-equipped and the whole house has a charming cottagey feel. We knew it was too early for the pool to be open so didn't get to experience that - we will have to come back. We were lucky with the weather however, it was very warm and we did use the sun-loungers. We visited many of the local towns, Casa Gorgacce is well located for that. All in all a very good holiday and a house that I am happy to recommend for families and for one or two couples. Our family of 5 (3 kids between 4 and 9) had a wonderful, relaxing holiday at Casa Gorgacce and heartily recommend it for families, friends and couples. The house is comfortable, clean and has all one needs. The wifi worked well throughout our stay. It is very easy distance to Mercatale village which we enjoyed visiting everyday for shopping, coffees and ice cream. We ate twice at Mercatale's Trattoria Mimmi which is very good value and very tasty. The local village has a range of shops, 2 small supermarkets, an excellent bakery, butchers shops and 2 pharmacies. There are at least 2 ATMs and 5 cafes between them and 2 trattorias. There are many other good restaurants within 15 minutes drive. The town of Umbertide which is a 20 minute drive has a colorful weekly market and larger supermarkets. Cortona and other local towns also have weekly markets. Casa Gorgacce is a great place from which to explore southern and eastern Tuscany and all of Umbria. Lake Trasimeno (the 4th largest in Italy) is a short drive and there are several pleasant lakeside towns, the nearest Tuoro has a beach with children's play equipment including trampolines. The ferries from here to other towns on the lake and to one of the 3 islands. Pedaloes, sun-loungers and beach umbrellas can be hired.